Thanks to sharp writing and a pitch-perfect ensemble cast, Frasier became one of the smartest and funniest television shows of the 1990s. Following the 1993 demise of Cheers, Diane’s fussy psychiatrist boyfriend, Frasier Crane (Kelsey Grammer), seemed an unlikely candidate for a spin-off series, yet the show earned smash ratings and dozens of Emmy Awards, including Outstanding Comedy Series and Outstanding Lead Actor (Grammer) in the very first season. 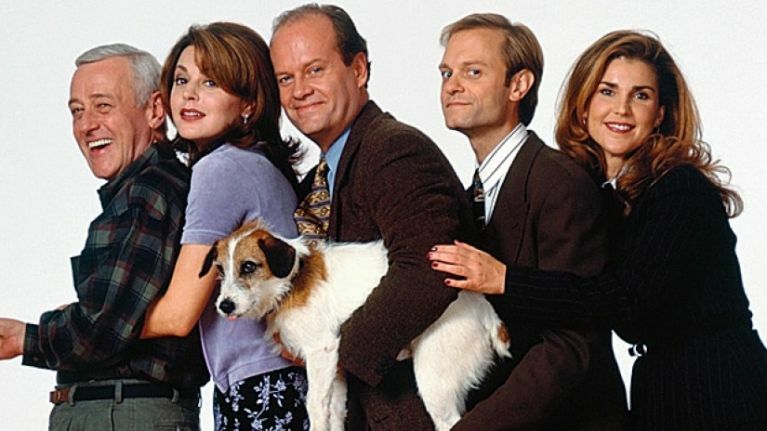 In an inspired bit of casting, Grammer was matched with David Hyde Pierce as his brother and fellow psychiatrist Niles, and the rest of the players included his radio-program manager, Roz (Peri Gilpin), his father, Marty (John Mahoney), his father’s physical therapist, Daphne (Jane Leeves), and the dog Eddie (Moose).